… Ju Honisch knows exactly how to embellish the stiff formality of the period and the exaggerated focus on etiquette with entertaining ironic wit. A reader will find a lot to smile about, expecially when Ju Honisch lets us experience the protagonists’ thinking seen from different viewpoints. This way, the novel evolves into an easygoing and entertaining read in which the author very often hits the mark with a precise or astute comment. 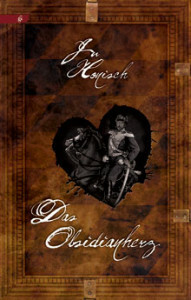 This way the “Das Obsidianherz” is not so much an historical romance but rather an imaginative historical thriller. Above all, “Das Obsidianherz” is a really good read – entertaining and fun – with lots of suspense. The fantasy component is carefully worked into the plot. Ju Honisch has written a highly enjoyable gerne mix which merits praise from start to finish. If you like novels with a fantasy components you should read this. Here we have a truly excellent narrator entering the stage, and I recommend this to friends of alternate history fantasy. I particularly liked how Ju manages to combine the intricacies of a spirited alternate history romance with a magic ‘action’ plot. This book is really well crafted. Set in Munich during the reign of “Mad King Louis” (Ludwig II) … a story unfolds that will thrill the fans of whodunits, fantasy, mystery and romance books equally well. Almost the entire plot takes place in one luxury hotel, thus boosting the intensity of the story. The characters are realistic and likeable, have their faults and foibles, and one gets drawn into the story right away. Magic, Fey beings and sinister creatures which never let you be quite sure whether they are in fact friend or foe – all this set in an historical environment. Absolutely enchanting! I for one could not put the book down – it was so exciting. I am looking forward to the next books. Obsidian Hearts combines the best of historical romance and contemporary fantasy — where “contemporary” in this instance means very definitely anchored in a specific time and place. Fascinating characters and a story that builds to an edge-of-the-seat climax, leaves the reader both satisfied and wanting more. Wonderful! This book leaves the beaten tracks of this genre and shows how small a step it takes to drift from everyday life into the realms of the fantastic. The successful combination of fantasy, adventure and historical novel fascinates the reader. The author skilfully familiarises the reader with the characters and their development within the plot. The readers can’t help but be drawn in. There are no stereotypes in this novel, and even known mythical creatures deviate nicely from the stock figures of the mainstream. The suspense is kept on a high level and unexpected twists keep the reader riveted to the book. – Please can we have more of this! This successful mix of romance, crime fiction and mystery fantasy cannot but please the reader. Adorable and complex characters, a well constructed plot and just as many historical facts to make the story realistic. Furthermore, the novel entices by being set – almost like a theatre play – in one and the same hotel. This makes it unique amongst other works of this genre and adds to the reading pleasure. Haven’t read such a good book for a long time. There was absolutely everything in it. Love, lots of intrigues, and above all: action! It was so exciting sometimes that I could hardly wait for it; there is no pause anywhere, things are happening all the time and as soon as one thinks one has understood what is happening, there’s the next problem coming up. All kinds of people are stuck in this hotel and try to get the manuscript first. Vampires, wizards, mad monks and mermaids… and this list could just go on. Really a great book. READ IT! In this book no one is as they seem. One surprising turn of events follows the next. The story is written with verve and wit and is exciting. I have laughed and cried with the characters; no other ‘new’ fantasy novel has enticed me like this one – not for a long time. (…) “Das Obsidianherz” is definitely a recommendable book for all who like fantasy and who have imagination enough to think that magic and the Sidhe are not restricted to Ireland but might just as well be found in Munich. (…) The book is altogether a very pleasant read which convinces [its readers] through its plot and its style. Ju Honisch’s dry sense of humour finds a good platform here and she knows very well how to work out the acting personae’s motives and backgrounds without drowning out the actual plot. The information can be found exactly where it is needed to understand the characters and their actions. (…) The setting in the 19th century in a Bavaria where magic and magical creatures exist, is very well established, and the historical/social circumstances of the era fit well into the story. (…) The love plot was integrated unobtrusivly and with a sense of humour, so that it helps the atmosphere of the book along rather than drowning it out. All in all this book is indeed very recommendable to all those who like an elegant writing style and fantasy. (…story summary…) Ju Honisch has an excellent feeling for people. Her novel tends to be more of an historical social novel in a parallel 19th century world. The acting personae are developed cleverly along the plot and introduced to the reader without being obvious about it. They play the game of games. Intrigues are rife in which the victims change again and again. Victims and culprits are interchangeable. Fey creatures like mermaids and sinister beings appear and disappear. (…) It is a thrilling novel with perhaps a touch too much love plot in the end. (…) Feder & Schwert have produced excellent quality here. The author succeeded in recombining the different strands of the plot into a thrilling show-down that finally leaves the narrow world of the hotel. A cute extra is the epilogue, (…) Just let me say that Ms [famous fantasy author] might have done well to write something like this. …I did not for a single second regret reading this book. (…) If it were set in London instead of Munich, I would call it Victorian fantasy. The setting is new and not previously done and full of atmosphere. 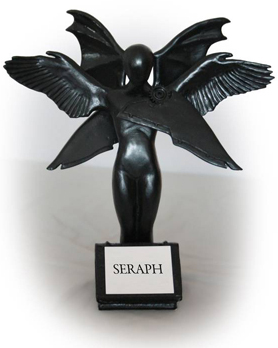 (…)The fantasy elements fit in so perfectly naturally that one might almost think that Sí and magic actually existed in our world – and they are no cute, cupidlike little elves but quite different from humans and yet not totally dissimilar. The book in its entirety (…) has convinced me – and I am rather critical. Ms. Honisch need not shun the comparison with international authors. …to conclude: her stories are quiet and focused mainly on the people in them. And it is that which makes them as thrilling and entertaining as an adventure story and sometimes more blood curdling than a splatter movie full of blood and guts. For she entices the reader’s own imagination and does not stifle it with an overabundance of descriptions. Surprising, effective, eerie – what more can you wish for? I am very happy with these stories. They were fun to read and it was more fun to ease yourself into the thoughts of the protagonists and then ask yourself – have these morbid thoughts come from an overactive imagination or does Ju Honisch have a dark soul? “A Matter of Opinion” is the title of the story which will give the reader a number of surprises. However, the reading pleasure does not end with this story. 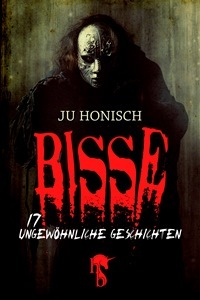 There are 17 more stories written by Ju Honisch and collated under the title “BISSE”. The stories are about love, and pain, and death, but they are all very different, sometimes mysterious, sometimes sad, but always thrilling. The author succeeds in finding new and baffling topics and ideas to surprise the reader. The endings are open, offering the reader an opportunity to draw their own conclusions. A pictorial writing style helps the reader identify with people and situations that are described for a mere couple of pages. The one criticism one might make is the simplistic front cover which does not do justice to the contents of the book. It is, however, only a small stumble stone which, once overcome, will not keep you from enjoying an otherwise excellent story collection.